Winner of the U.S. ARSC (Association for Recorded Sound Collections) Award for Excellence in 2010 for the Best History in Rock or Popular Music published in that year. 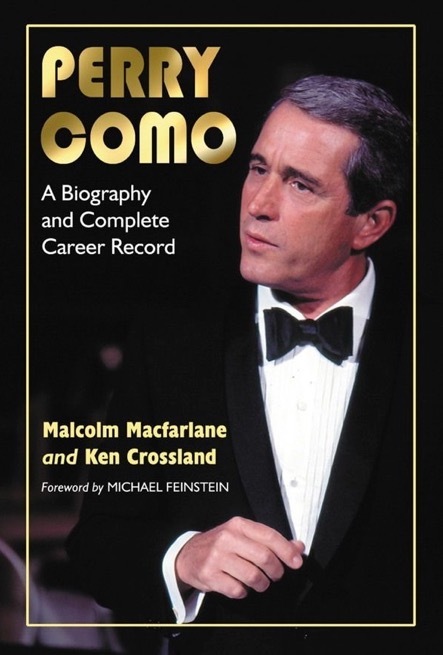 Ken’s biography of singer, Perry Como, co-written with Malcolm Macfarlane, was published by McFarland Publishing in the USA in 2009. A softcover edition, together with an e-book, was published in 2012. Perry Como’s career extended from 1933 to 1994. He recorded over 700 songs and in the 25 years from 1945 to 1970, his record sales exceeded 100 million – only Bing Crosby, Elvis Presley and the Beatles in that period, sold more. Between 1945 and 1976, he scored 131 charted records in the USA, fourteen of which reached the top spot. As a pioneer of television, he made his debut on Christmas Eve 1948 and went on to host an incredible 1049 shows and guested over 80 times on other programs. His Christmas specials became a holiday fixture and were invariably highly rated by the audience measurement organisations. He made headlines in 1959 when he signed a television contract worth $25 million over a two-year period. Como’s career illuminates developments in the music and television business in the middle of the last century. The biography features 73 photographs, a complete discography, a listing of all television appearances, and a year by year chronology of Perry Como’s life from 1912 to 2001.